Manage your business accounts effectively with Sage 50 Accounts Professional 2015 for a truly comprehensive, easy-to-use system that lets you fully manage your customers, suppliers and day-to-day finances. This software is suitable for single users, but additional users and companies licences are available for an additional charge. 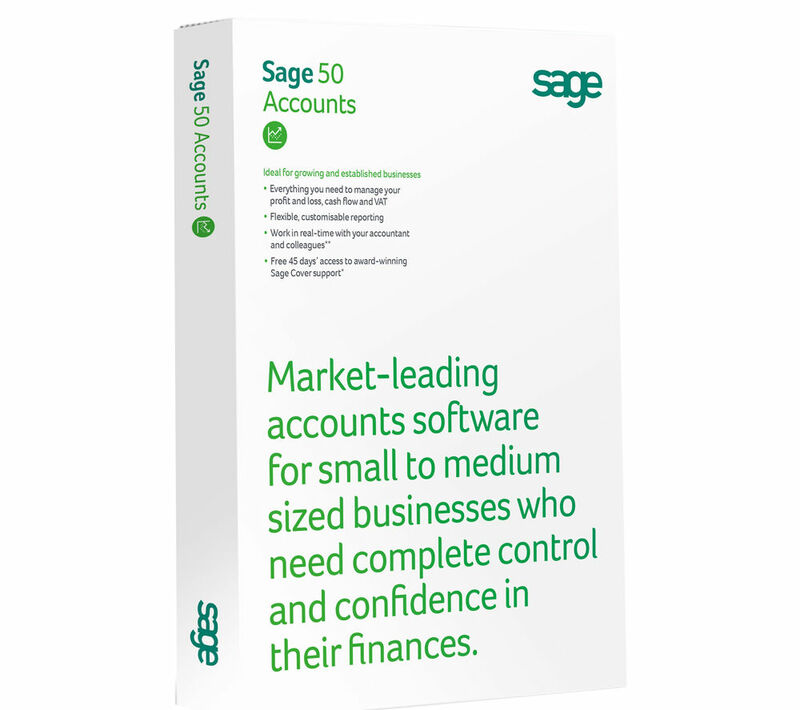 Manage your accounts with Sage 50 Accounts Professional 2015 that allows you to customise the software to suit your business. Set things up quickly with jargon-free language to help guide you through your accounts, whilst the simple setup wizard gets you on your way quickly to help you work more efficiently moving forward. The software includes guides and videos helps to talk you through processes and tasks, showing you how to do it on screen. There's also 45 days of free telephone support and online support to help to get you off to a flying start with your software. You will be able to keep a close eye on your business performance thanks to the range of over 900 reports, including Profit and Loss and a balance sheet. The reports are customisable so you can view detail that suits your business. Reconcile your bank accounts and help to keep accurate records so you can keep on track at a glance with Sage 50 Accounts Plus 2015, which gives you the data you need to conduct your business on a daily basis. For a truly integrated system, 50 Accounts Professional 2015 can sync with Outlook so you can manage your time. Use the built-in diary and it will sync with your Outlook calendar so you can keep track of your appointments, reminders and more. Customers are the base of a business, so this software allows you to stay updated on customer activity and record invoices, payments, statements and phone calls. You can create professional invoices and quotes to send by post or via email, and even encourage prompt payments and keep your cash flow healthy by adding a 'pay now' option to your email invoices. You can also keep track of outstanding payments and which of your suppliers are waiting for payment. Whether you're familiar with VAT or just getting to know the process, Sage 50 Accounts Professional 2015 can make it simple to calculate, verify and submit your VAT return to HM Revenue & Customs online. Avoid unnecessary fines and mistakes using the VAT verifier. VAT can be confusing, so the 'show me how' feature helps to give you the confidence that you are entering the correct information and processing transactions correctly for your VAT scheme. Submitting your VAT is simple using this software. You can submit returns to HMRC in as little as three clicks, and a record of your return with submission receipts will be automatically stored alongside your VAT returns. Payments are just as quick as you can send payment instructions to your bank to pay HMRC via e-banker, straight from your software. Calculate the value of your stock using the opening and closing stock wizard so you can maintain an accurate stock value for your financial reports. You will be able import stock take from Excel and CSV files, and remove old products or services so you can be sure your stock list shows items currently on sale. With 50 Accounts Professional 2015, you can get live access to your information to keep you up to date no matter where you are. You can view customer details, or even create sales orders and invoices with cloud sharing that gives you absolute control wherever you are in the world. Work smarter and more efficiently and take control of your business accounts with Sage 50 Accounts Professional 2015. - Internet connection with a minimum download speed of 2 Mbps.